Perhaps our most unique animals on the ranch are our Jacob’s Sheep. Also know as Four-Horned Rams, these animals actually have four horns with two jutting out from the top of their head and two that curl around their face. 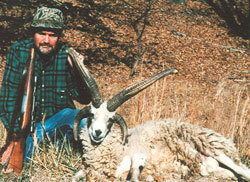 The wooly sheep not makes for an interesting mount, but its fiery personality and unique appearance has also made the Jacob's Four-Horn Ram Hunt a popular hunt among visitors to our ranch. For more information on Jacob’s Four-Horn Hunting at High Adventure Ranch, please call (314) 209-9800 or fill out our contact form.